The United States Military is part of the very fabric of San Antonio. It is interwoven into the city’s culture, economy, industry, way of life and, most importantly, its people. The two are inextricably linked throughout history, with the military helping to shape San Antonio and San Antonio helping to shape the military. 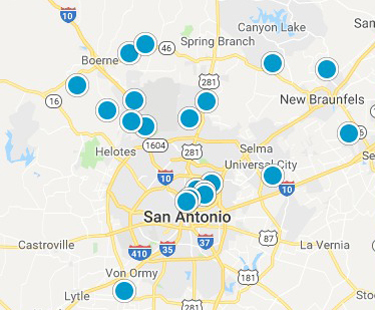 An understanding of the military’s history and current presence in the city is pertinent, not only to people in the armed forces, but to anyone who plans to call San Antonio home. After all, the city bears the patriotic nickname of Military City U.S.A.
Camp Bullis Established in 1917, Camp Bullis is a 27,994-acre Army training camp. It is located on IH-10 and Loop 1604, northwest of San Antonio. Together with Camp Stanley, Camp Bullis comprises the Leon Springs Military Reservation. There are approximately 130 military personnel stationed at Camp Bullis. Camp Bullis is frequently used by Army units stationed at FSH as well as the Army Medical Department Center and School, Defense Medical Readiness Training Institute and Air Force Ground Combat Skills School. Fort Sam Houston Since 1845, the U.S. Army has utilized San Antonio as a headquarters, logistical base, mobilization and training site, garrison and provider of medical support. Initially, the Army leased facilities from the city, including the historic Alamo. In 1876, the city donated 92 acres of land known as Government Hill. Shortly thereafter, the Army moved its facilities and began construction on what would become Fort Sam Houston. Lackland Air Force Base Lackland Air Force Base originated in 1942, when the War Department separated a part of Kelly Field and made it into an independent installation. The base was originally named the San Antonio Aviation Cadet Center. In 1947, it was renamed after Brigadier General Frank D. Lackland. General Lackland was the first to propose an aviation cadet reception and training center at Kelly Field. Randolph Air Force Base Randolph AFB was designated in 1930 as a flight training base. Dubbed the West Point of the Air, Randolph was the largest construction project undertaken by the U. S. Army Corps of Engineers since the building of the Panama Canal. The base was named after William Millican Randolph, a native of Austin, Texas, who made significant contributions to aviation during his career. Realty United has the resources and information you need when searching for a home in the San Antonio Texas area. Our real estate services are absolutely Free to home buyers.